Met an old friend at lunch today. Big Red. 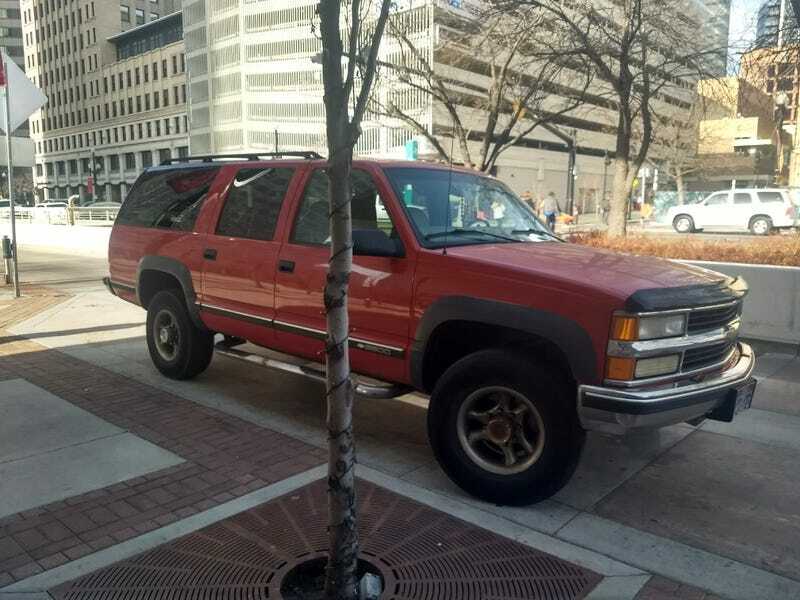 We bought this 1997 K2500 in either 99 or 2000 as the family truckster/work vehicle/tow rig and used it well for at least 10 years. In that time my dad had is supercharger, with tubular headers and dual exhaust. installed. at about 7 psi inter-cooled boost through the Vortec 454 it moved pretty well. We sold in around 2012 to some guy who was going to use it for a farm truck. He must have taken great care of it because aside from the rusty nerf bars and wheels it looked really good. Here is what It looked right right after the supercharger and exhaust install. The cow catcher was removed by thieves who cut it off to make it stand out less when they took it. They also cut the lead for the 9th injector for the supercharger and ran it lean so the engine had to be rebuilt. Thanks guys. It was also involved in an accident so bad it cracked the PS front wheel in half and bent the frame, but it was all repaired with a frame straightener and we drove it trouble free for many miles after that. It was a good truck and it warms my heart to see it still on the road and in decent shape. "An automotive journalist to some degree"